The 2011 Tokyo Motor Show could be the most exciting event in years in Japan with several significant new cars. Here's what's happening. The Tokyo Motor Show may be small in comparison to Frankfurt, but this year's event was a corker. Here's the lowdown. Alpina unveiled its version of the BMW 6 Series Convertible at the Frankfurt Motor Show and for Tokyo the German tuner wheeled out the tin-top B6 Bi-Turbo Coupé. We already know that the five-door A1 is entering production but Tokyo was the first chance we got to see the car in the flesh. The Sportback is scheduled to arrive in the UK in March carrying a £560 premium over the three-door model. The big news on BMW's stand was the debut of the production ready ActiveHybrid 5 - an F10 5 Series powered by a 300bhp 3.0-litre TwinPower inline six and a 55bhp electric motor. Sales for the car are expected to start in spring. The D-X (or D-Cross as Daihatsu would rather you call it) is technically a design study but if it does not preview a new Copen then we will eat our hats. It's powered by a turbocharged two-cylinder engine and there are rumours of micro-SUV and shooting brake variants. Daihatsu joins the growing fad of debuting urban 'quadricycles' with the Pico concept. Following in the footsteps of the Renault Twizy, the Pico is a 1+1 electric commuter vehicle that Daihatsu says is targeted at elderly people and delivery businesses. It does have scissors doors though and they are cool. The AC-X is Honda's answer to the Toyota Prius plug-in and would appear to show the next generation Civic Hybrid. Said to offer a comfortable and enjoyable driving experience the AC-X will allow drivers to choose between 'engine drive mode' for more spirited driving and 'automatic drive mode' that sees the steering column retract allowing the driver to put their feet up on the built in footstool. We had originally guessed that the Small Sports EV Concept car (as it was called then) might preview a new S2000 but with Kei-car dimensions and a power output of 58kW (79bhp) from its lithium-ion battery the EV-STER is closer to the Honda Beat. A range of 99 miles and a 0-62mph time of five seconds makes us want one - just replace the silly levers with a proper steering wheel first. Said to represent Honda's vision of city cars of the future the Micro Commuter Concept is a single-seat electric car that does away with the trusty steering wheel in favour of a joystick. No thanks. Say hello to the new Mazda6. As expected the Takeri concept was confirmed as the next generation Ford Mondeo rival. Power is set to come from either 164bhp 2.0-litre petrol or 173bhp 2.2-litre diesel versions of Mazda's SkyActiv engine there is also talk of the possibility of a range-extending EV much like the Vauxhall Ampera. Mitsubishi is planning on turning back time with the new Mirage by reverting to the compactness, affordability and high fuel efficiency that made the first iteration so successful in 1978. Designed primarily for emerging markets the Mirage will be powered by a 1.0-litre MIVEC engine that promises to return 85mpg. The PX-MiEV II is a plug-in hybrid SUV that combines a 2.0-litre petrol engine with the EV technology used in the current i-MiEV. Capable of driving over 30 miles on electric power alone Mitsubishi claims the PX-MiEV is capable of an astonishing 141mpg. The ESFLOW was first unveiled earlier this year in Geneva but the mid-engine, rear-wheel drive sports car deserves a second outing especially when you consider that the 'engine' is actually the same unit used in the LEAF. An EV that might actually be good to drive? We will just have to wait and see. Not quite the Juke-R we had hoped for, but, if the Juke Nismo enters production (which we fully expect it to) it will become the highest powered Juke model with a Nismo-tuned engine putting out about 200bhp. The car also marks an important turning point for Nismo as it emerges from the shadows with eyes on BMW's M Sport division and RenaultSport. Think of the Pivo3 as a LEAF that has been put on a hot cycle in the washing machine. The little electric city car features a McLaren F1-style 1+2 seating arrangement and all-wheel drive thanks to electric motors in each wheel. Despite the quirky looks the Pivo is slated for production with 2016 being mooted. Is it a car? Is it a van? Is it an SUV? Despite being around since the Paris Motor Show in 2010 we are still not 100 per cent sure what the Townpod is. Described as 'An unprecedented tool for today's entrepreneurs' the Townpod combines the usability of a van in the body of a LEAF/Cube hybrid. The ATC previews the next generation Legacy wagon. Powered by a downsized 1.6-litre turbocharged engine the ATC is a stylish looking estate that features a full-length glass roof and a steering wheel mounted infotainment system. Built in collaboration with Toyota the BRZ is Subaru's version of the GT 86. Powered by a 200bhp naturally aspirated boxer engine that sends all its power to the rear wheels the BRZ is lightweight and features a low centre of gravity so should be a hoot to drive. Scheduled to go on sale in the UK in July 2012 there is still no word on prices. Subaru also unveiled a 300bhp BRZ-based racecar that will race in the Japanese Super GT Series. Normally a new generation Impreza would grab all the attention on the Subaru stand, but not this year. Two new models were on display - the five-door Impreza Sport and four-door G4. Both will be use the latest boxer engines and Lineartronic transmissions. Lighter and more aerodynamic than before, the new Imprezas should be the most fuel efficient ever. Also unveiled was a pair of hot run-out models for the current Impreza range. The S206 and NBR Challenge Edition are powered by uprated boxer engines that produce 315bhp and 318lb.ft. of torque. Destined for the Japanese market only, all 100 NBR Challenge cars are already sold with limited amounts of the S206 remaining. A tiny city car that can also be used as a delivery vehicle - that will be the Q-Concept then. The 2.5-metre long electrically powered micro mobility car is said to be ideal for everyday journeys within a radius of about six miles. This is the car that has caused most arguments in the Car Enthusiast office with some saying Suzuki's vision of a next generation global compact car is inspired by the Renault 8 Gordini while others see touches of the Nissan Figaro. Whatever the inspiration the lightweight, 90mpg car is brill looking and we only hope it moves on quickly from concept to production. Suzuki has been a bit tight-lipped with the exact details of the Swift EV's powertrain but what we do know is that it will feature a Vauxhall Ampera-like range extending petrol engine to recharge the boot-mounted battery. The FCV-R (Fuel Cell Vehicle - Reality & Revolution) concept is said to point towards the launch of a fuel cell vehicle by 2015. The mid-sized saloon can accommodate four passengers and their luggage and has a cruising distance of roughly 430 miles thanks to a fuel cell stack with a 70MPa high-pressure hydrogen tank. The FT-EV III is an all electric city car based on the Toyota iQ. Expected to go into production during 2012 the lithium-ion powered car has an estimated range of 65 miles. The only real surprise about Toyota's end of the 'Toyobaru' collaboration (other than how much we want one) was that it retained the 'hachi roku' element of its name. The car formerly known as FT (Future Technologies)-86 is now simply GT 86. 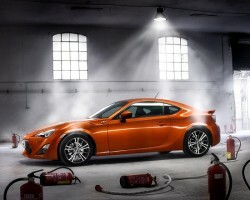 Due to enter the UK market in June 2012 the new rear-wheel drive coupé is powered by the same 200bhp boxer engine as the Subaru BRZ and promises the same kind of driving thrills. No official word on prices yet but speculation points to it coming in between below £30,000. Smaller than the Prius we already know the Prius C is expected to be called the Aqua when it finally hits the showrooms. Said to offer over 60mpg around town the new car is not expected to arrive in the UK where we will have to make do with the Auris and Yaris HSD models. VW's possible Range Rover Evoque rival was one of the few surprises at Tokyo. Sitting between the Golf and Tiguan in size, the Cross Coupé gives us an idea of what VW SUVs of the future will look like, but as it is also based on the new 'modular transverse matrix' platform it could actually make it to production. The possibility is strengthened by a sheer lack of concept madness with even the electric motor on the rear axle seeming a distinct possibility. VW's answer to the Audi Allroad and Skoda Superb 4x4. The rugged crossover features raised suspension, protective body cladding and a 4Motion four-wheel drive system. Power will be provided by VW's 2.0-litre TDI engine with outputs of 138- or 168bhp. No word yet on pricing but UK order books are expected to open in April.